We have begun the second half of our 2018-2019 school year right where we left off before winter break. Students came prepared to learn and have done an exceptional job following our newest policies. Your support has really made a difference. Thank you. To review, we are requiring all students to have an updated ID card available, at all times, to present to staff while on our Galileo campus. Additionally, students will refrain from wearing the “hood” part of their hoodies while inside our building. Lastly, because of our continued focus on academics, cell phones will not be allowed out, used, or seen during the instructional day. This includes headphone and other electronics. Students will have continued landline access to phone calls from the classroom and the office. Please have a conversation with your student regarding these policies. We truly appreciate your understanding in advance. 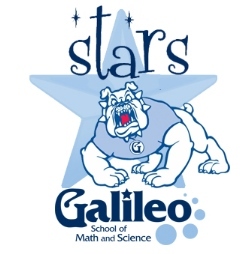 Galileo School of Math and Science currently has two social media accounts. Our Facebook account can be found at https://www.facebook.com/galileoschool/ or by clicking the Facebook logo on the bottom of our webpage. Our Twitter account is Galileo SMS @GaliSMS. Any other social media including Instagram and Snapchat, that has our logo or name on it is not an official school account and we do not control it. When we find out about these accounts we do what we can to shut them down but unfortunately, the companies that provide these accounts are not always helpful about removing false accounts. Please be aware that we do not promote, condone, or sanction anything that may be found on these counterfeit accounts.